This image was taken from the northeast lawn of the Glen Iris. It is copied from a private photo album and is dated 1896. 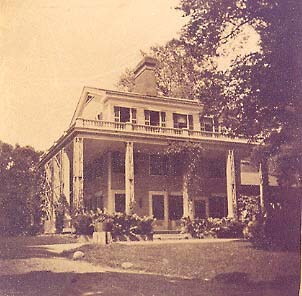 It shows Mr. Letchworth's home at the time when he began to lay the groundwork for his Estate to become a State Park. Please note the four windows facing the camera on the third floor - the first two (left to right) are the windows to Mr. Letchworth's study, the next two mark the location of his private sitting and bedroom, now the "Maple" suite at the Inn.